Dynamic load testing using Pile Driving Analyser (PDA) equipment is a high-strain non-destructive load test method which can be performed during or after pile installation using conventional pile driving equipment. This test can be applied to driven steel, driven timber and even concrete piles (eg. pre- stressed driven concrete piles, drilled shafts, auger cast piles). PDA equipment calculates the velocity and force signals obtained from accelerometers and strain transducers attached to the pile during driving. This data is analyzed using CAPWAP software to calculate the pile capacity. PDA testing can be undertaken during initial driving or during re-strike drives after allowing soil setup on the pile for a suitable period of time. PDA testing is undertaken in conformance with ASTM Standard D4945-12. Since introduction of the 2006 Alberta Building Code, pile foundations have been designed based on the Ultimate Limits State (ULS) design method. Ultimate geotechnical capacity parameters are factored using the Geotechnical Resistance Factors (GRF) listed in the National Building Code of Canada. For conventional pile design a GRF of 0.4 is required, but with PDA testing, the GRF may be increased to 0.5. This means smaller or shorter piles can be used to carry the same loads as conventionally designed piles. This translates into direct savings in the order of 20 percent on pile foundation materials and associated installation costs. Costs can be even greater with pile length optimization to eliminate the need for splices. Example 1: A medium sized industrial plant project with 800 driven steel piles originally designed based on a GRF of 0.4. The 219 to 406 mm pipe piles were to be driven into very stiff till with design depths of 10 to 18 m (avg. of 12.5 m). A design review and PDA test pile program was undertaken. Since cap connections details were already designed, the pile diameters were not changed. but the design lengths were reduced. Overall, the required pile lengths were reduced by 15%. The original design called for about 150 splices for piles over 15 m. The installations were done with standard pile lengths and no splices. Extra PDA testing on production piles verified the design capacities were achieved. The piling component of the original foundation budget was $1.45M. The reduction of the piling costs was about $300,000. The cost of the test pile and production pile PDA testing programs were $30,000 plus about $20,000 for 4 days of test pile installations. The net savings for the project was over $200,000. Example 2: A small building project with 46 driven steel piles originally designed based on a GRF of 0.4. The 273 mm pipe piles were to be driven to refusal in weak bedrock at 8 to 12 m. Standard 12 m pile lengths were proposed with 1 m stickup. During initial driving, the resistance at 11 m embedment did not meet with the original final set requirements, suggesting it was required to splice and extend the piles 2 to 3 m deeper. The piles were allowed to setup for a few days and PDA testing was undertaken to verify the loads. After testing, only 3 of the 46 piles needed to be extended. The original piling budget was $75,000 plus mobilization. The proposed budget to splice and extend piles was $37,000. The actual bill for the three extended piles was less than $5000. The cost of the PDA testing, including contractor costs was $12,000. The total project savings was about $20,000. Similar results have been experienced on many other projects. As a result, PDA technology is rapidly gaining acceptance in the local construction industry. 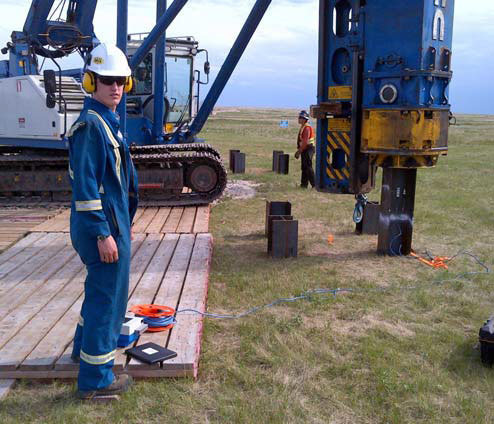 To service this growing demand, ParklandGEO currently has 8 PDA units servicing Western Canadian projects. This represents about 15 percent of all the PDA units currently available in Canada. testing of a pile for the full installation. testing of the pile several days after initial drive (ie. “Re-strike”). Testing during the full drive of a pile will provide a complete record of the pile installation, including the ability to assess initial capacity and pile integrity along the full length of the installed pile. Testing at the end of installation only verifies the EOID capacity. In many soil profiles, the capacity at EOID is unlikely to be the ultimate capacity for a pile. Pile driving can produce excess pore pressures around the pile shaft which allows for easier installation. As a result, PDA testing during initial drive will usually produce lower capacity results. After driving, the pore pressures dissipate and the friction acting on the pile shaft increases. This capacity gain is called “soil-pile setup”. The setup gain can be measured by comparing the PDA capacity results from EOID and Re-strike testing. In some wet soils, the setup gain in capacity can be in the order of 50 to100 percent. PDA tests only provide direct measurements for the forces and motions at the pile head. The static and dynamic soil parameters and distribution of forces/ motion over the pile shaft and toe are not directly measured. To verify the static component of pile resistance, CAPWAP analysis is performed on field data from a selected representative hammer blow from the PDA test record. CAPWAP analysis resolves three unknowns: the internal pile forces, pile motions and external forces. Soil parameters and pile shaft/toe resistance distributions are estimated and adjusted through an iterative process in the CAPWAP software to plot a computed wave response. The process is repeated until a reasonable match is achieved between the CAPWAP wave curve and with the measured wave response from the field data (ie. signal matching). The final CAPWAP result provides a “corrected” resistance result for the pile, the pile shaft and the pile tip. A significant amount of judgement has to be applied during the CAPWAP analysis to ensure that the final results make sense in terms of the available soil and groundwater information for the site. To allow the use of a GRF of 0.5, a representative amount of PDA testing needs to be performed. For typical building projects at least 2 to 5 percent of the piles should be PDA tested. For Alberta Transportation bridge projects 10 percent of the piles need to be tested for design verification (or 5 percent can be tested for basic quality assurance at a GRF of 0.4). It should be understood that while PDA testing is relatively unobtrusive, some loss of production may be experienced during testing. If testing is performed during production piling, it is recommended to clearly identify in the tender document that PDA testing will be undertaken, in order to avoid contractor claims for delays. It should also be expected to allow for at least 24 to 48 hours for final verification of piling criteria based on CAPWAP analysis. Alternatively, initial PDA testing can be performed during a separate test pile program completed prior to production piling.